The Romeo y Julieta Wide Churchills is a creamy medium Robusto, 5.1” (130mm) long, of 55 ring gauge, and comes in aluminum tubes in a 15 cigars box. 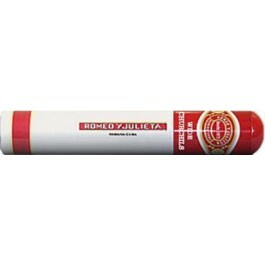 It is one of the latest additions by Habanos S.A. to the Romeo y Julieta brand. After the Short Churchill was released with great success in 2006, Romeo and Julieta modelled all their newer vitolas after this awesome cigar. This is why the Wide Churchill is slightly longer and somewhat wider than the Robusto sized Short Churchills. The cigars are packed full of smooth, subtle, medium flavored aromas. Launched in 2010. The format of this Romeo y Julieta Wide Churchills appeals to present-day smokers for a shorter and smoother smoke. • Notes of orange peel, wood, roasted hazelnuts and hints of leather abound. •	Delicious aromas of cedar, nuts, spices and some dark fruits notes. • Very smooth smoke that is never over powerful. In short, the Wide Churchill is comparable to the best phase of the Churchill. The wrapper is as perfectly rolled as possible, the triple cap is flawless and with no visible seams. The cigar has a beautiful colorado claro tone, like milk chocolate and it is sporting a special golden band that reads “Wide Churchill”. The puff before lighting up the cigar is very easy and pleasant. There is a discreet taste of tobacco to it. The construction of the Wide Churchill is superb, as the effortless draw reveals it and as the burn does not require any attention. About an inch of dark ash holds on strongly at the foot of the cigar. Generous billows of smoke are generated at each puff and the smoke tastes of earth and minerals. In the second third, the cigar reveals its complexity and richness as some fruity and spicy flavors emerge, black currant and nutmeg that is. The nutty aromas are going to the background. It is a great middle third, the ash becomes much whiter and the burn line that was uneven because of the large cigar gauge starts to straighten. To be able to smoke the final third, you need to peel the “Wide Churchill” band off. And then you meet again the flavor profile of the first third, dominated by smooth aromas of nuts and punches of spices. There is no need to put down the cigar as it never gets too hot, and it’s a delight to enjoy it to the nub. In summary, the Wide Churchill is a wonderful Habanos of perfect construction, very rich and never too powerful.